8.34 points at 32 votes (rank 39). The tribal chiefs (middle) wears an unusual headdress. Set the sails in Spain. Equip your expedition and head west into the unknown. If you return with gold and new maps, you will be appointed governour or even vice king by the court. Discover the new world. Explore the Mississippi, the Amazonas, the Strait of Magellan, gold veins and 200 different settlements from small farm villages to mighty Aztec and Inca towns. The Aztec and Inca towns have the most gold. The natives are the key to success and a mirror of their souls. More than 2800 different screen graphics form the world that you will discover. 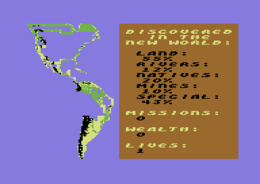 A map can be created that corresponds to your route on the already explored continents. 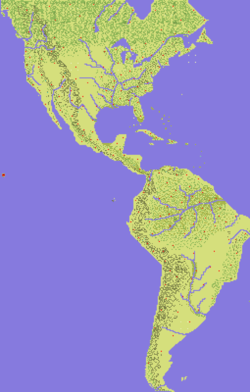 This map is an exact copy of the geograpgy and the population of North, Central and South America. 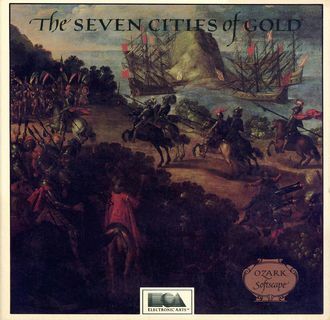 The game "Seven Cities of Gold" was graphically and acoustically first class at its time. Especially the details are enthusing: If autumn comes, the small trees change their colour. ...at sea, shortly before landing. ...or rather doing it the hard way. ...an animation from the game - the start. Several levels are possible: Novices get basic equipment and instantly see all native villages. Depending on the situation you can choose the policy for conquering and actions. If it is successful, you can build forts or trading missions. Promotions are made after returning to the home country and they are rewarded with additional resources for further expeditions. 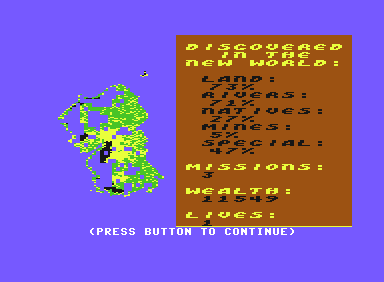 The original data disk contains the countries of the historical America. 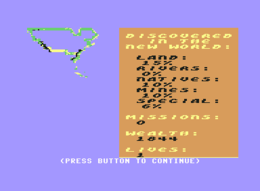 A new world can be created on an empty disk with a required time of approx. 20 minutes. If you trade peacefully with the natives, you will also get native carriers which you unfortunately cannot take on a ship. By this not only the transport capacity rises on land, but the natives also work as a guide. If you stop shortly on the normal overview map, it can happen that the natives point to hidden conditions (e.g. "Gold mine west"). The invisible object is then typically within the visible area of the map which you just need to search thoroughly in the direction that was given. All actions are triggered over menus with the joystick. The Indian carriers are especially important. You get them if you conquer Indian villages or trade with them. Without carrier you can only take 10 Food which is used up quickly. There is one more for capitals. You'd best keep in mind where the Inkas are and land there and trade, so you will get the maximum number of carriers. If you want to find the secret towns you must rely on the carrier's hints. You get a promotion especially for founding missions. To be named vice king, however, you need to have discovered, plundered and subjugated at least 50% of the "New World" until 1540. Most of the gold is at the Inkas. Simple wander along the Amazonas and then plunge into the Andes. Conquests go faster if you carefully approach the tribal chief and kill him first. If too many Indians die before that the chief will hide and the fight will get much more difficult. 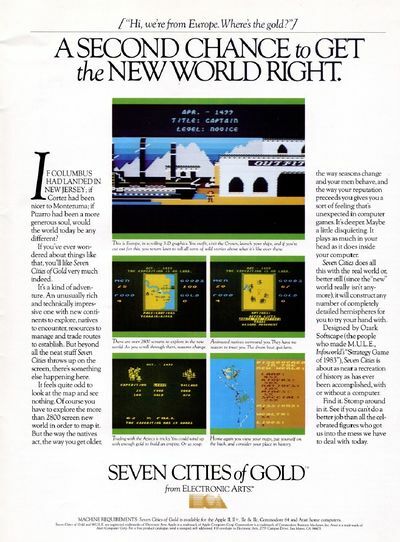 Sledgie: "Seven Cities of Gold is one of the first 'exploring games' and provided the game idea for many games of this genre to come. The game runs fast, the controls by joystick are very simple and the motivation lasts very long (at least with me)." 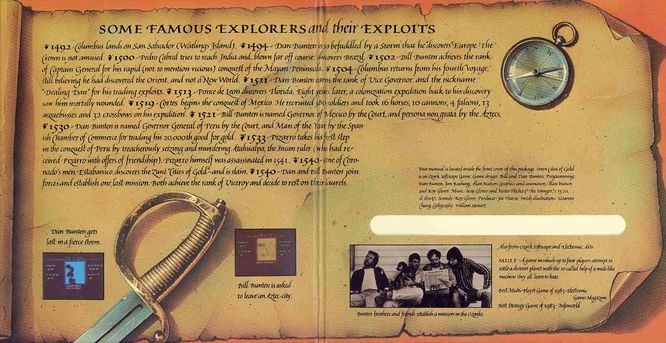 Klaws: "I have also played Seven Cities of Gold often and persistently - however, never until the end. It is acutally very much fun. But if you want to reach 100% of all conquer categories, the game will get rather tiring because the processes repeat themselves. There are no special demands for a strategic approach. I once discovered one of the seven "lost cities" by fate. I bumped with the ship into an (optically empty) island the size of only one field. In the moment of contact an unusual text concerning the display of the terrain characteristics lit up and therefore I sent a team onto the island and thus discovered one of the hidden cities. As you cannot have native guides on board, I could have searched a long time for it without being lucky and stumbling upon it by fate. --Klaws 13:52, 23. Aug 2005 (CEST) ." Gerry: "I still remember well how I played the game often with a friend. When you started the game, you were confronted with different options after some time. Depending on your choice you were asked to insert different disks. As our knowledge of English was quite bad at that time, we once chose the wrong option and with this accidentally deleted the game disk :-(." 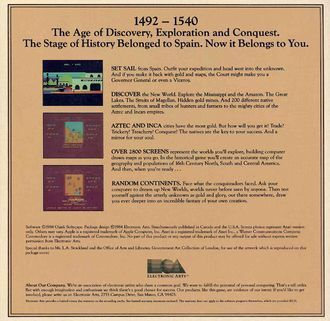 The name of the game is derived from the Saga of the seven cites of Cibola. This page was last modified on 28 August 2016, at 15:37.